The mystery “foam” …… was raw sewage. Michael Fullilove (Daily Beast): …. The president was accused of neglecting alliances and ceding too much ground to allies in Libya, but this week’s successes in Tripoli prove he’s heir to Roosevelt and Truman. …. Conservative commentators have mocked Obama’s belief in the efficacy of international rules. Obama wrote in The Audacity of Hope that “nobody benefits more than we do from the observance of the international ‘rules of the road’.” Many of these rules were established by Roosevelt and Truman, who believed that a rule-based system amplified U.S. power rather than constraining it…. …. Obama’s response to the Arab Spring, though initially uncertain and clumsy, came to be characterized by a blend of caution and hardheaded liberalism. He now places a lesser premium than most of his recent predecessors did on the stability provided by Middle East allies, and a greater premium on their people’s right to democracy. But some of those allies can no longer provide stability anyway. …. Events this week indicate that Obama’s approach in Libya has managed to cripple the Gaddafi regime in a way that maximizes the Libyan people’s ownership of the victory and minimizes the risks and costs to the United States. The contrast with George W. Bush’s approach in Iraq is stunning. … Obama’s critics also fail to acknowledge that he is much more popular with allied publics than was his predecessor …. it has restored drooping public support in allied countries for the idea of allying with Washington. For example, the number of Australians who believe the U.S. alliance is very important to their country’s security has shot up by 23 percent since the nadir of the Bush administration. …. Franklin Roosevelt and Harry Truman, the founders of America’s alliance system, were hardheaded liberals. They would certainly recognize Barack Obama as their heir. 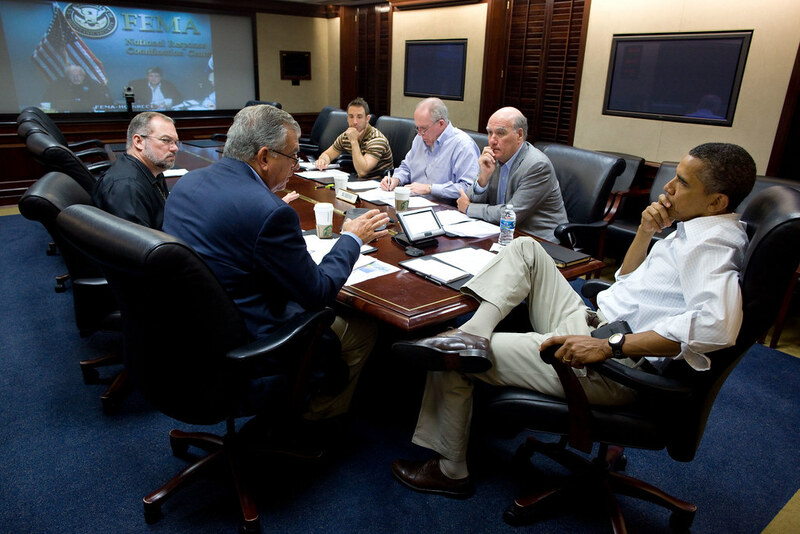 President Barack Obama receives an update on Hurricane Irene in the Situation Room of the White House, August 27, 2011. The President convened a video teleconference at 10:30AM this morning in the White House Situation Room so that he could receive an update on the impact of Hurricane Irene. Vice President Biden, Chief of Staff Daley, DHS Secretary Napolitano, Treasury Secretary Geithner, Transportation Secretary LaHood, Energy Secretary Chu, FEMA Administrator Fugate, Homeland Security Advisor Brennan and other senior White House officials participated in the call. The President was updated on the response and recovery efforts that are currently underway in coordination with state and local officials as well as the status of critical energy and transportation infrastructure in areas that have been impacted as well as areas that continue to be impacted by this storm. He was updated on FEMA’s support to state and local partners as important damage assessments begin in areas where the storm has passed. 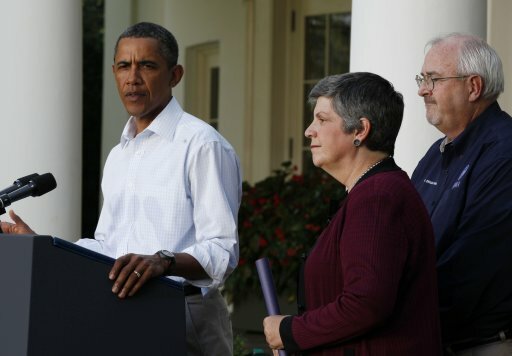 The President asked Secretary Napolitano and Administrator Fugate to continue to be in touch with Governors and local leadership up and down the East Coast. The President directed that all federal efforts on response and recovery operations underway continue, and he will reconvene the team this evening. Federal Emergency Management Agency Administrator Craig Fugate said Sunday that federal, state and local governments are working together better in the aftermath of Hurricane Katrina. “I think the big [lesson] — and this is one Congress recognized and passed the Post-Katrina Emergency Management Reform Act – was that we shouldn’t have to wait until a state is overwhelmed to begin getting ready, that we should be able to go in before the governor’s made a request, have supplies ready, have our teams in the state and work as one team, not waiting for damages to occur and that formal request to come,” Fugate said.